In 1236 Ibn Nafis moved to Egypt and worked in Al-Nassri Hospital then in Al-Mansouri Hospital where he became chief of physicians and the Sultan’s personal physician. When he died in 1288 A.D. he donated his house, library and clinic to the Mansuriya Hospital 1. 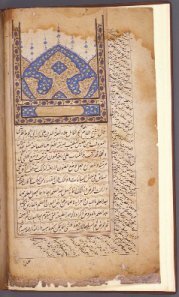 The most voluminous of his books is Al-Shamil fi al-Tibb, which was designed to be an encyclopedia comprising 300 volumes, but was not completed as a result of his death. The manuscript is available in Damascus. His book on ophthalmology is largely an original contribution and is also extant. 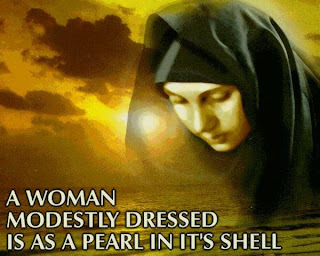 His book that became most famous, however, was Mujaz al-Qanun (The Summary of Law) and a number of commentaries that were written on this same topic. His commentaries include one on Hippocrates' book, and several volumes on Ibn Sina's Qanun, which are still extant. Likewise he wrote a commentary on Hunayn Ibn Ishaq's book. Another famous book embodying his original contribution was on the effects of diet on health entitled Kitab al-Mukhtar fi al-Aghdhiya. His major original contribution of great significance was his discovery of the pulmonary circulation, which was re-discovered by modern science after a lapse of three centuries. He was the first to correctly describe the constitution of the lungs and gave a description of the bronchi and the interaction between the human body's vessels for air and blood. He also elaborated on the function of the coronary arteries as suppliers of blood to the cardiac musculature. The discovery of the pulmonary circulation is an interesting and much debated topic. It is commonly believed that this discovery had its inception in Europe in the sixteenth century by Servetus, Vesalius, Colombo, and finally Harvey. However, in view of the discovery of ancient manuscripts, it is proposed that the real credit for the discovery of the pulmonary circulation belongs to an eminent physician of the thirteenth century: Ibn Al-Nafis. In 1924 an Egyptian physician, Dr. Muhyo Al-Deen Altawi, discovered a script titled, "Commentary on the Anatomy of Canon of Avicenna" in the Prussian state library in Berlin while studying the history of Arab Medicine at the medical faculty of Albert Ludwig’s University in Germany 2. This script is considered one of the best scientific books in which Ibn Al-Nafis covers in detail the topics of anatomy, pathology and physiology. This discovery revealed an important scientific fact, which up to then had been ignored: the first description of the pulmonary circulation. The theory that was accepted prior to Ibn Al-Nafis was placed by Galen in the second century, who had theorized that the blood reaching the right side of the heart went through invisible pores in the cardiac septum to the left side of the heart where it mixed with air to create spirit and was then consequently distributed to the body. According to Galen's views, the venous system was quite separate from the arterial system, except when they came in contact through the unseen pores 3. "The lungs are composed of parts, one of which is the bronchi, the second the branches of the arteria venosa and the third the branches of the vena arteriosa, all of them connected by loose porous flesh." Ibn Al-Nafis was thus the first to put forward the concept of the coronary circulation. These important observations were not known in Europe until 300 years later when Andrea Alpago of Belluno translated some of Ibn Al-Nafis’ writings into Latin in 1547 5. Later, Michael Servetus described the pulmonary circulation in his theological book, "Christianismi Restitutio", in 1553 and wrote, "...air mixed with blood is sent from the lungs to the heart through the arterial vein; therefore, the mixture is made in the lungs. The bright color is given to the sanguine spirit by the lungs, not by the heart." 6. It is worth mentioning that the Church accused Servetus of heresy for opposing the teachings of Galen, and was consequently -with his book -burnt at the stake. Andreas Vesalius described the pulmonary circulation in his book "De Fabrica", in a manner similar to Ibn Nafis' description. An interesting observation is that in the first edition of the book (1543), Vesalius agreed with Galen that the blood "... soaks plentifully through the septum from the right ventricle into the left...” Then in the second edition (1555) he omitted the above statement and wrote instead..."I still do not see how even the smallest quantity of blood can be transfused through the substance of the septum from the right ventricle to the left..." 5. Another similar description was given by Realdus Colombo in 1559 in his book "De re Anatomica" 6. Then it was William Harvey who, in 1628, demonstrated by direct anatomic observation in laboratory animals the movement of blood from the right ventricle to the lung and then observed the blood returning to the left side of the heart via the pulmonary vein and again he stated that he could not find any pores in the interventricular septum. He wrote in his monograph, "Exercitatio anatomica de motu cordis et sanguinis in animalibus": "I began to think there was a sort of motion as in a circle. 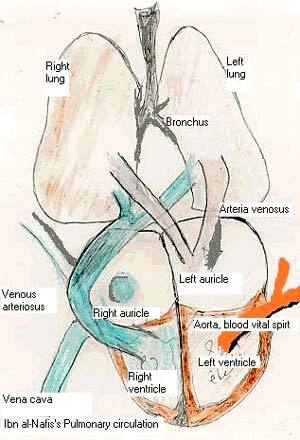 I afterwards found true, that the blood is pushed by the beat of the left ventricle and distributed through the arteries to the whole body and back through the veins to the vena cava and then returned to the right auricle, just as it is sent to the lungs through the pulmonary artery from the right ventricle and returned from the lungs through the pulmonary vein to the left ventricle, as previously described." 6 However, he did not understand the physiology of the pulmonary circulation (dissipation of carbon dioxide and replacement with oxygen), which was fully elucidated by Lavoisier in the 18th century 3. Sami Haddad 4 from Lebanon published an article in the Annals of Surgery in 1936 about Ibn Nafis and other articles were published also by Ayman et al 9 and Dr. Abdul Kareem Shahadah from Syria 10 showing clearly that Ibn Al-Nafis should be given the credit for the discovery of the pulmonary circulation 300 years before William Harvey was even born! 1- Qatayyah, S. The Arabic Physician Ibn Nafis (in Arabic). 1st Ed. Beirut: Arabic Corporation for Studies and Publication, 1984:37-43. 2- Keys, T.E. & Wakim, K.G. Contributions of the Arabs to Medicine. Proceedings of the staff meet. Mayo Clinic 1953; 28:423-37. 3- Gordon, E.J. William Harvey and the Circulation of the Blood. South Med J 1991; 84:1439-44. 4- Haddad, S.E. & Khairallah A.A. A Forgotten Chapter in the Circulation of the Blood. Ann Surg 1936; 104:1-8. 5- Coppola, E.D. The Discovery of the Pulmonary Circulation: A New Approach. Bull Hist Med 1957; 31:44-77. 6- Mettler, C.C. History of Medicine. Philadelphia, PA, USA. The Blakiston Co, 1947:40-59 and 113-128. 7- Al-Dabbagh, S.A. Ibn Al-Nafis and the Pulmonary Circulation. Lancet 1978; 1:1148. 8- Meyerhof, M. Ibn Al-Nafis and His Theory of the Lesser Circulation. Isis 1935; 23:100-20. 10- Islamic Medicine online by Dr. Sharif Kaf Al-Ghazal.